Slanted-edge regions can often have non-uniformity across them. This could be caused by uneven illumination, lens falloff, and photoresponse nonuniformity (PRNU) of the sensor. Uncorrected nonuniformity in a slanted-edge region of interest can lead to an irregularity in MTF at low spatial frequencies. 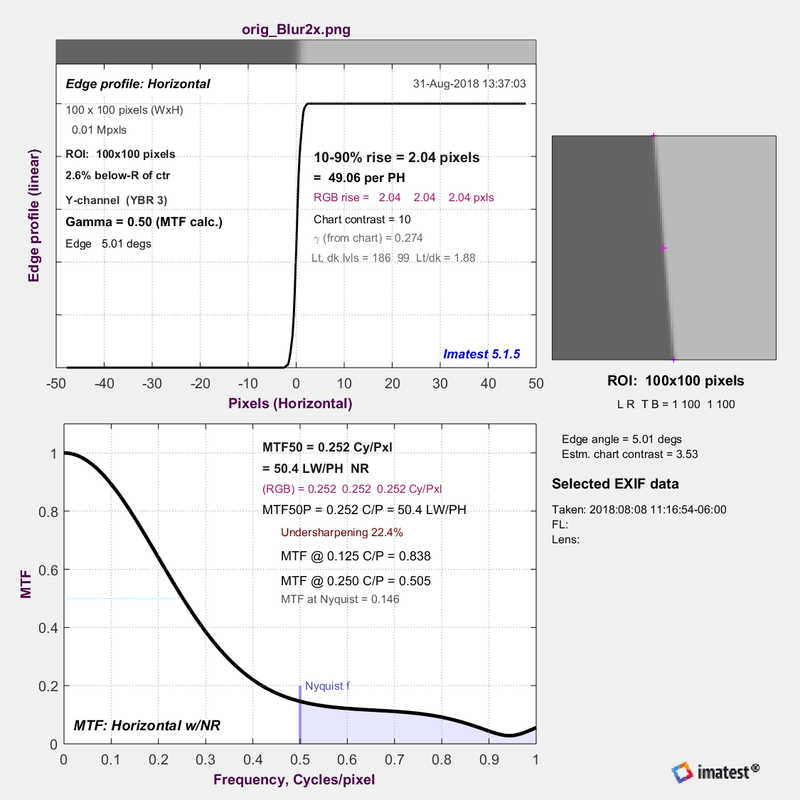 This disrupts the low-frequency reference which used to normalize the MTF curve. If the direction of the nonuniformity goes against the slanted edge transition from light to dark, MTF increases. If the nonuniformity goes in the same direction as the transition from light to dark, MTF decreases. To demonstrate this effect, we start with a simulated uniform slanted edge with some blur applied. If the nonuniformity includes an angular component that is parallel to the edge, this adds a sawtooth pattern to the spatial domain, which manifests as high-frequency spikes in the frequency domain. This is caused by the binning algorithm which projects brighter or darker parts of the ROI into alternating bins. Although every effort should be made to achieve even illumination, it’s not always possible (for example, in medical endoscopes and wide-FoV lenses). Imatest 4.5+ has an option for dealing with this problem for all slanted-edge modules (SFR and Rescharts/fixed modules SFRplus, eSFR ISO, SFRreg, and Checkerboard). It is applied by checking the “Nonuniformity MTF correction” checkbox in the settings (or “More” settings) window, shown on the right. When this box is checked, a portion of the spatial curve on the light side of the transition (displayed on the right in Imatest) is used to estimate the nonuniformity. The light side is chosen because it has a much better Signal-to-Noise Ratio than the dark side. In the above image, this would be the portion of the the edge profile more than about 6 pixels from the center. Imatest finds the first-order fit to the curve in this region, limits the fit so it doesn’t drop below zero, then divides the average edge by the first-order fit. For this example, Imatest’s nonuniformity correction reduces our example’s -26.0% to +22.8% change in MTF down to a -3.5% to +4.7% change. This is an 83% reduction in the effect of the worst cases of nonuniformity. While this is a large improvement, the residual effects of nonuniformity remain undesirable. 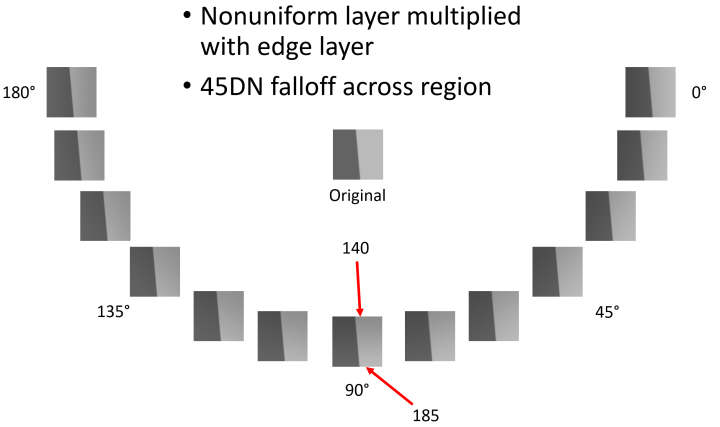 Because of this, we recommend turning on your ISP’s nonuniformity correction before performing edge-SFR tests or averaging the MTF obtained from nearby slanted edges with opposite transition directions relative to the nonuniformity to reduce the effects of nonuniformity on your MTF measurements further. We assume that the illumination of the chart in the Region of Interest (ROI) approximates a first-order function, L(d) = k1 + k2d, where d is the horizontal or vertical distance nearly perpendicular to the (slanted) edge. The procedure consists of estimating k1 and k2, then dividing the linearized average edge by L(d). k1 and k2, are estimated using the light side of the transition starting at a sufficient distance dN from the transition center xcenter, so the transition itself does not have much effect on the k1 and k2 estimate. To find dN we first find the 20% width d20 of the line spread function (LSF; the derivative of the edge), i.e., the distance between the points where the LSF falls to 20% of its maximum value. If the edge response for x > dN has a sufficient number of points, it is used to calculate k1 and k2 using standard polynomial fitting techniques. The result is a more accurate representation of the edge with the effects of nonuniformity reduced. For any questions on how to do this, or how we can help you with your projects, contact us at support@imatest.com. This entry was posted in All Versions, Uncategorized.